During those warm summer months you often spend a ton of time in a bathing suit sitting next to a refreshing body of water. Soaking up the summer rays and splashing in the cool water is where the memories are made. The best beach towels are ones that combine absorbency, comfort and style. Whether you are a fashionista, looking to buy some value family towels or are looking for the best transportable towel we have what you need. Soaking up some quality vitamin D is one of the best parts of summer. Spreading out on the best oversized beach towels or laying it over your beach chair will ensure that you can move around without the worry of being covered in sand. This is an excellent beach towel. It is made from 100% ring spun pure cotton. This makes it exceptionally soft. Cotton is known for being one of the best materials when it comes to towels and face cloths. This towel is on the large size measuring 30 inches by 60 inches making it perfect for double duty as a beach blanket and towel. You can set up your spot on the beach around this beach towel. You can rest assured that this towel is high quality as it is made in an OEKO-TEX Standard 100 factory. This means that every blanket made in their factory is the best possible quality while also being environmentally conscious. This high quality allows you to throw it in the washing machine and dryer to clean this towel. This is one of the best plush beach towels. It is made from 100% cotton which has long strands of material giving it a soft absorbent texture. Kaufman has made a towel that can be used every day. Even though this is an excellent beach towel you can use it whenever you need to dry something. You will always know what towel is yours with this one. If you have kids they will love this towel as it has an intricate fish and water design with blue and green colors. Your friends will be jealous since this towel is large enough for you to stretch out and relax without getting sand all over you. Even though this is a large towel, coming in at 30 by 60 inches, it is easy to fold, store and transport. Simply throw this towel into your waterproof backpack and you are ready for hiking to your favorite beach. 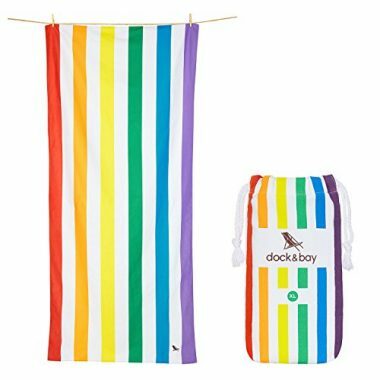 Dock & Bay have made one of the best extra large beach towels on the market. This option comes in 2 great sizes: 63 inches x 31 inches or 78 inches x 35 inches. If you are a tall person (over 6 feet tall) the extra large option is ideal for you. It will allow you fully stretch your legs without burying them in sand. This beach towel features a microfiber material that excels at absorbing water while having a quick drying system built in as well. In fact, it has been touted as drying up to 3 times faster than cotton towels. What will impress you is that sand will not stick to this towel. This towel has been featured on Dragons’ Den where this feature was showcased. No longer do you have to put up with sand sticking to your body. Simply shake this beach towel off and you are sand free. Dock & Bay are so confident in is Microfiber Beach Towel that they offer a comprehensive warranty and money back guarantee. If you are not satisfied within 30 days simply let them know and you will be able to return it for a full refund. Their 12 month warranty also has your back for an entire year. If anything goes wrong, like the towel fraying or fading, simply let them know and they will remedy the issue. These colorful summer towels are great for families. 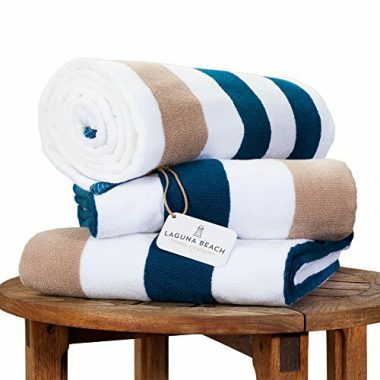 Coming in at an unbeatable price point these striped beach towels hold an unbeatable value. With bright colors this multicolor set is ideal to show off each family member’s personality. The large size is desirable amongst kids and adults alike. Weighing about a pound each this towel is folds up small to be incredibly portable. The soft feel is bound to go over well with the whole family. These towels are incredibly absorbent making them ideal even for use on pets. These cotton towels are thick and plush making them ideal for both sun bathing and splashing in the water. These towels are machine washable making them even more family friendly. 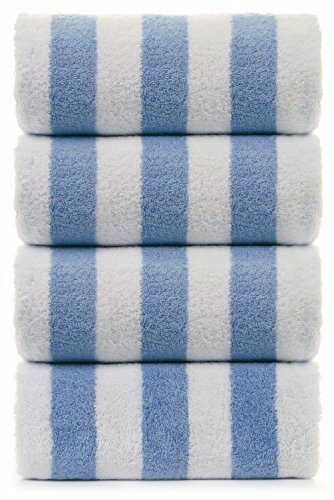 Incredibly durable these towels will not bleed their color. Built to last longer than regular towels you can easily see the quality in these pool towels. 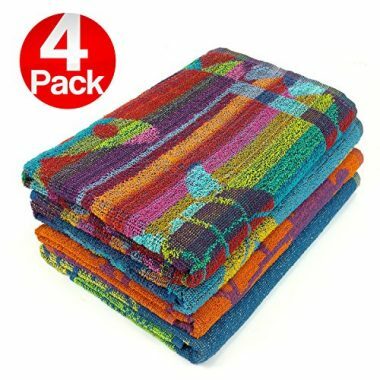 The affordable price for this 4 piece towel set is unbeatable and one of the best deals on our list. Genovega has one of the largest color and style options of any beach towel manufacturer. For example, this line of towels has 21 options. They vary from a round patterned style with frills on the edge to a more traditional rectangle striped towel. No matter which one you choose you can know that you are getting a high quality beach towel from a highly reputable company. The round versions are made from a 100% microfiber material which weighs just a mere 1.2 lbs. (550 grams). This makes them ultra portable where you can simply throw them in the trunk of your car and always have them with you. 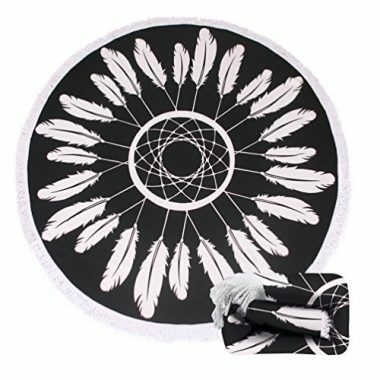 These beach towels also have a diameter of 62 inches which mean even tall people will be able to lay without touching the ground. The rectangle options come in a two or three pack. There are 6 color styles to choose from which gives you the ability to match your own personal style. This version comes in an extra long dimension of 30 inches by 66 inches. Genovega also offer a 30 day money refund guarantee. If you have any issue with your beach towels or order simply contact them and they will be happy to help you. This top quality travel beach towel is one of the best on our list and it is easy to see why. Travel Works is responsible for this quality towel that comes in 4 different relatively neutral striped colors and in 2 different sizes. Whether you choose to go with the large or extra-large towel you will enjoy how small these towels fold. This makes them the ultimate travel companion. This soft towel is made from microfiber material which allows it to dry fast when wet. This high quality material is also desirable as it is incredibly absorbent. 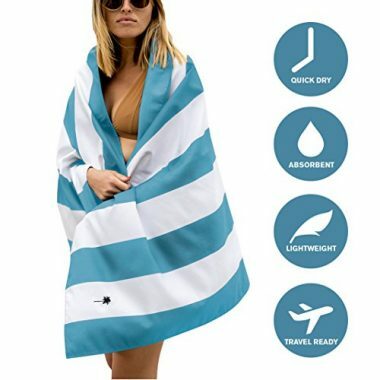 The lightweight design of this towel is sure to provide all the benefits of a beach towel with the added functionality of it being an excellent travel option. With an included canvas carrying bag you can be assured that this towel is built to last. This densely woven polyester blend absorbs water without taking the dirt and sand with it. Simply shake off the towel, wring it out and it is ready to go. This fuss free towel has a generous size which is perfect for tanning. Travel Works may not be a very known name in the towel world but that doesn’t take away from its impressive quality. They are so sure that you will love this towel that they even included a 12 month warranty. This risk free purchase makes it a no brainer for those that travel frequently. Utopia Towels made such a great towel that they decided to sell in bulk. This 4 pack of towels come in 3 different colors or you can even get a variety pack so each family member gets a different color of towel. Made using 2ply yarn and soft cotton, this is an incredibly plush towel that is great for long hours spent tanning. Large beach towel reviews are raving about the value in this family sized set. The bright striped colors are easy to spot in a crowded beach and have a bright summer feel. Weighing just over a pound each these lightweight towels are ideal for kids and adults alike. The comfortable thick fabric is incredibly durable making it great for everyday use. Incredibly absorbent this beach towel is even great for use on pets. You can easily see the quality in these towels as they are able to withstand long exposure to the harsh sun. This towel is fully machine washable for added convenience. Getting softer with every wash you can rest assured that this towel is built to last. This towel uses hypoallergenic material that are safe for use with just about everyone. Laguna Beach Textile Company is responsible for these cute towels for the beach. This towel is available in 3 different colors making it easier than ever to match your current summer style. The striped design has a high end look making it incredibly desirable amongst fashion forward individuals. The unisex design has near perfect reviews with consumers raving about the quality. Made using 100% cotton makes this towel incredibly soft and comfortable. That makes this a perfect towel for summer lounging. Much like sheets, there is a thread count that determines quality and softness of your towel. This towel features 630 grams per square meter (gsm) of cotton as opposed to the typical 400gsm found in most other beach towels. The higher thread count makes the towel thicker and plusher for long term use. This thickness also helps the towel to absorb moisture more efficiently making it feel dry for longer. This towel is incredibly absorbent making it ideal for those who enjoy splashing in the water. This towel is machine washable making it even more desirable. Full of quality this towel is incredibly durable and built to last. Weighing less than 2 pounds this towel is timeless. Cotton Craft are one of the leaders of the industry when it comes to beach towels. Their Jacquard Double Woven Beach Towel is made from 100% ring spun cotton. This makes it super soft while creating a thick padding between you and the ground. The cotton material is thicker when compared to a microfiber option. This means it will give you added cushion allowing you to set up on the rocky shores other people can’t. It also has a special fast dry system which gives you the features of the thinner towel as well so you get the best of both worlds. You are sure to stand out with this towel. 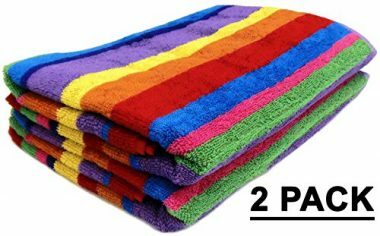 The package comes with two towels that feature a bright rainbow of colors. Each stripe is a unique color ranging from green to pink to blue. Cotton Craft have a reputation of excellence. They have made towels that are spa and hotel quality for a fraction of the price you’d expect. This means they will hold up to any amount of abuse you throw at it. Dock & Bay have created one of the top rated beach towels on the market. 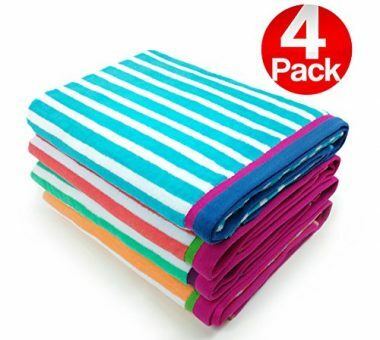 This Microfiber Beach Towel comes in a package of 2 or 4 which is great if you have children. It has been made from 100% Genuine Turkish Cotton making it even softer when compared to normal cotton. You can rest assured that there is no chemicals, dyes, or solvents that will affect your skin. In fact, this fabric actually gets softer the more you wash it – something other towels struggle with. Like most other towels on our list this one has dimensions of 30 by 60 inches. These towels have gone through a meticulous manufacturing process. Dock & Bay are so confident in their product that they offer you a 30 day money back guarantee. If you are not satisfied with this purchase simply let them know and they will give your money back. 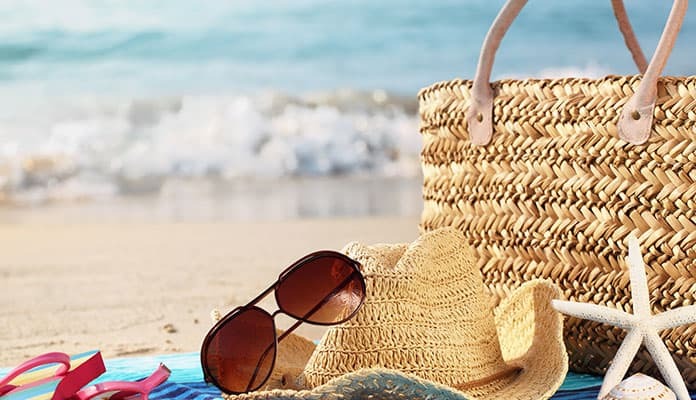 A beach towel may seem like a simple enough purchase, but there are many features and terms that will help you choose the best one for you. Everything from the material to the size can affect your day at the beach. Microfiber is also another popular textile. This is a material is thinner than the usual cotton weave. The polyester or nylon is excellent at absorbing water which makes it a great beach towel. If the beach you frequently visit has sandy shores this can be one of the better materials you will find. The size of your towel can vary. We find the ideal size is around 30 inches by 60 inches. This allows you to sprawl out and not get sand everywhere. Of course, this can vary depending on how tall you are. If you are on the taller side you may want to look for a 2 or 4 pack so you can extend the towel to fit your size. Some have oversized versions but these are not common. You may not know this, but there are circle beach towels as well. These aren’t nearly as popular but work just as the traditional rectangle options. They are measured by a diameter (the distance from the middle to outside edge). These towels allow you to potentially fit more people on them. For example, an adult can lay in the middle while small children are situated on either side. We find a good diameter to be around 60 inches. This gives you enough space to fit a person lying comfortably or up to 3 or 4 people sitting. To determine how thick your towel should be you will have to determine your use. If you frequent a rocky beach you will want a towel on the thicker side. It will protect and cushion your body especially if you are the type of person who likes to sunbathe. If your favorite beach is sandy you will be able to opt for a thinner towel. Just as the sheets you buy display a thread count, towels feature the same technology. Regarded in terms of grams per square meter (gsm) this will show you the quality of the towel. Most towels sit between 350-450 gsm. A high quality towel can have as many as 600-650 gsm. This means that there is more cotton (or any other material) per square meter. This makes your towel thicker, softer and provides a plusher feel. A beach towel will have to be able to dry you off quickly. If it fails to do this you will find yourself looking to replace it with one that does. But at the same time, if it doesn’t have a quick drying technology you will be laying on a damp or wet towel. Not only does this attract sand fleas but it doesn’t feel very good. Having a towel that absorbs water while drying quickly is ideal. Just keep in mind a thinner towel may be a little worse at drying you after a swim. What it gives up in absorbency it gains in drying time. A thin towel won’t take much time to dry, especially if it is sitting on the hot sand. Even though this shouldn’t be at the top of your list it should at least be a consideration before you buy. Some towels come in a bright pattern while others are more muted. It is best to look at photos before you decide on one to see how it looks. Also, the color can determine how well a towel holds up to time. Say for example you get a white, or even a striped towel. It will start to show stains or dirt quicker than a darker shade of color. But at the same time, a black or dark colored towel will also heat up faster. All of these factors can determine the perfect color for you. How easy your best beach towels are to clean will depend on a few aspects. Some towels have a frill around the edge of the seam which can make them difficult to clean. Others have a ring spun cotton that requires it not be put in the drying machine. With that being said, most of the options on our list are able to be simply thrown into the wash and hung to dry. All of the cotton, microfiber and synthetic towels will have this ability. We suggest hanging to dry them as they can lose their softness after repeated cycles through the dryer. The best beach towels don’t have to cost an arm and leg. You can find a great cotton option for around $25. Some of the options on our list come in packages that include 2 or even 4 towels making them even better of a deal. Everything from the material to the size and even color can affect the pricing of these items. For example, an oversized, or circular, beach blanket may cost more than a standard size. Just keep in mind that these towels should last for a few years, depending on your use. Spending a little extra to ensure you are getting a soft beach blanket that is the right size for you can be seen as an investment. 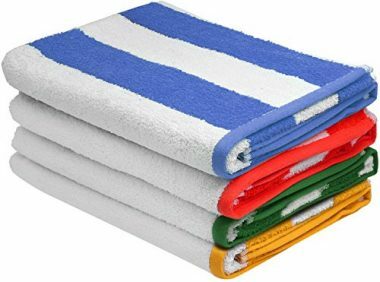 Most, if not all, of these beach towels can also double as a towel you use after a shower as well. This makes them a towel that you will be using every day, not just at the beach. Q: What Is The Difference Between A Regular And Beach Towel? A: There are a few subtle differences between a regular towel and a beach towel. You will usually find that a beach towel is longer than a regular towel. Regular towels are usually around 52-58 inches in length while a beach towel is around 70 inches in length. This allows someone to be able to lay on the towel without them being in the sand. 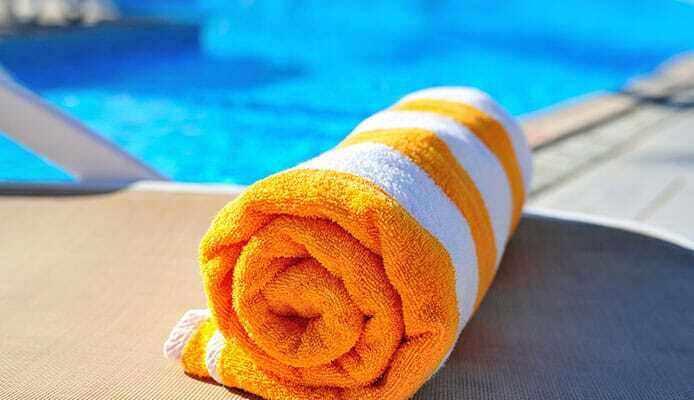 A beach towel is often thinner than a regular towel. As they are longer, there is less of a need for them to be thick as there is more surface area to dry your body. One of the primary features of a beach towel is to provide a barrier between you and the sand, and a thin towel can do that. You may also find that there is a difference in appearance between the two towels. 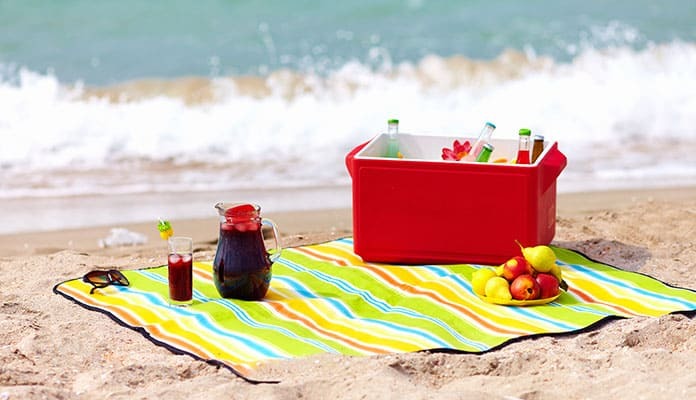 A beach towel is more brightly colored. This makes them easier to spot at the beach while a bath towel will most often be chosen to compliment the decor in a bathroom. Q: Are Beach Towels Waterproof? A: No, the best beach towels are not waterproof. They are designed for two functions. They are used to create a barrier between you are the sand, and they are designed to dry your body after being in the water. If a beach towel were waterproof, then it would not be able to dry you after you had been for a swim. Having said that, you may notice that one side of a beach towel is different from the other. One side is generally better at drying you off while the other will be more resistant to collecting sand. Q: Why Do I Need A Special Beach Towel? A: You do not technically need a special beach towel, but there are a couple of reasons to get one. Firstly, they are longer, and you will be able to lie out on them without being in the sand. They also have more of a resistance to collecting the sand. This means that you will be bringing less sand back home with you. By using a dedicated towel, you will not be without your regular towel. After using a beach towel, it needs to be washed. If you use your regular towel, then you will have to wash that after. 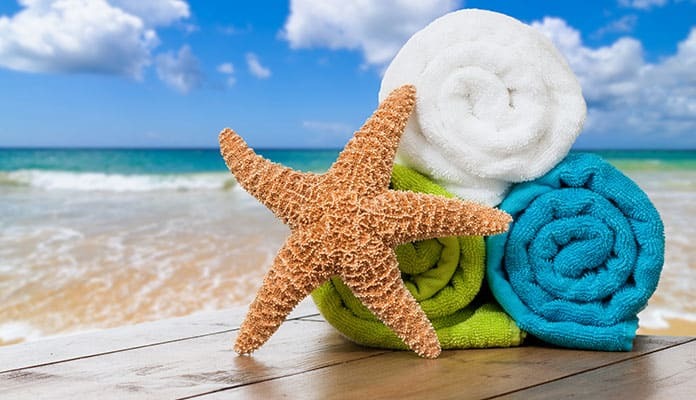 Using a dedicated towel also means that your regular towels will not be worn down by the sand or salt water. Q: How To Clean My Beach Towel? A: You should clean your beach towel after every time you use it. The first thing to do is to get rid of any sand and debris. Shake the towel off outside to rid it of any particles. You are going to wash your towel as you would with any of your regular towels, but we would still recommend rinsing it first with warm fresh water to remove as much of the sand and salt as possible. This will help to keep those out of your washing machine. Once the towel is rinsed, you can wash it on the same cycle you would a regular towel, and then dry it in the same way too. 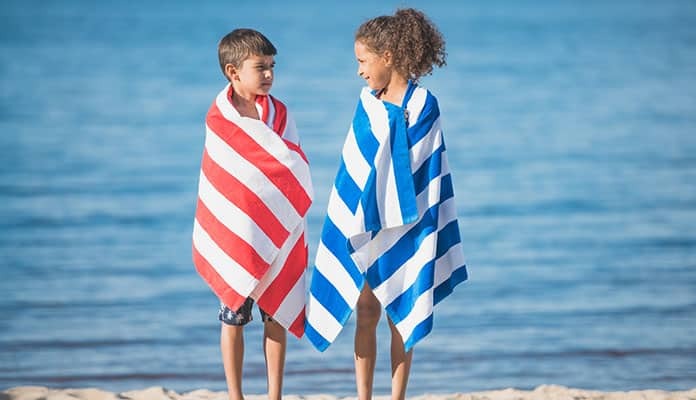 With so many of the best beach towels on the market, you will be able to find high quality plush towels that are great for lounging all day as well as compact travel towels that focus more on being fast drying. Whether you spend the whole day basking in the sun or in the shade under an umbrella you will want a high quality towel that will last. All of the towels on our list combine cost effectiveness with a quality that you are bound to enjoy. If you liked this article be sure to read about our top beach tents to get you all geared up for summertime. They are an excellent companion to beach towels and offer an excellent source of protection from the harmful UV rays from the sun. Do you use one of the best beach towels that made our list for your summertime adventures? Talk to us about how you like it in the comment section below.